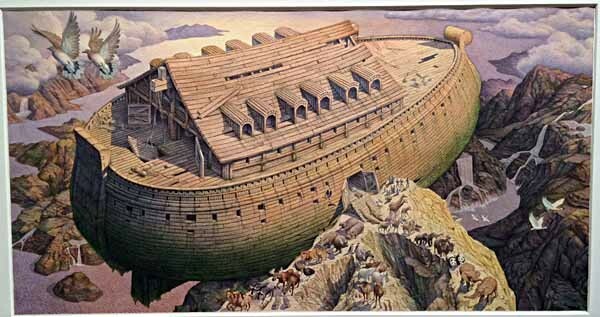 Noah’s Ark by Charles Santore. This and all art images below © Charles Santore. This entry was posted in Music, Reviews on January 25, 2015 by Todd. 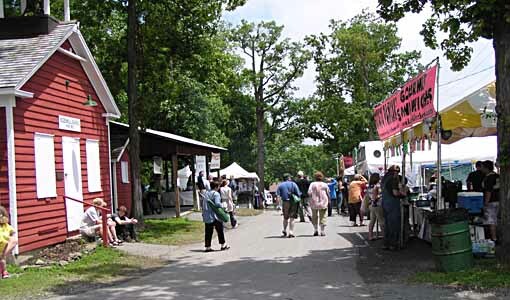 The first time I heard of this music festival, held each year at the fair grounds in Altamont, New York was last summer. My long-time friend Tim had gone to it in 2010 on his own, and enjoyed it, so when we saw him later in the summer, he had lots of good stories to tell, and suggested we might want to go with him this year. It did sound like fun, so Ellen and I made plans, and we met Tim there last Friday. 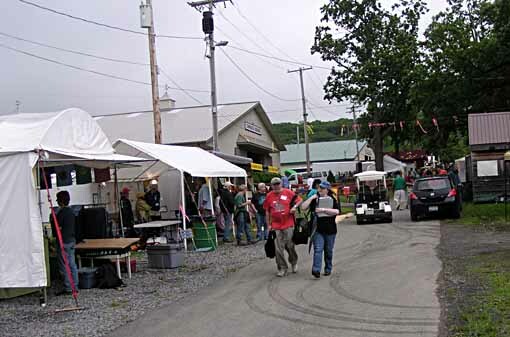 It was a gloomy day, with rain off and on, and when we got there around 3 PM things were still being set up, but by evening the fairgrounds were full. 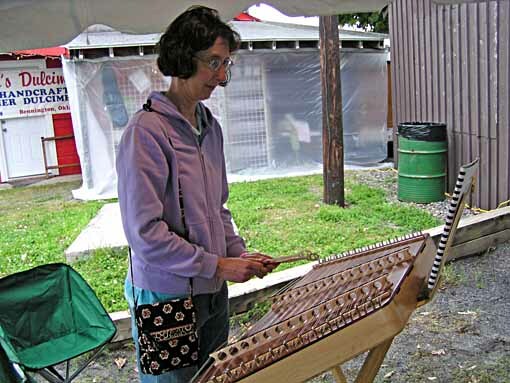 Friday afternoon there were a number of workshops or classes scheduled, and Ellen decided to take a lesson on the Hammer Dulcimer, which she enjoyed. We met up with Tim, and he decided to do the Choral Harmony workshop. 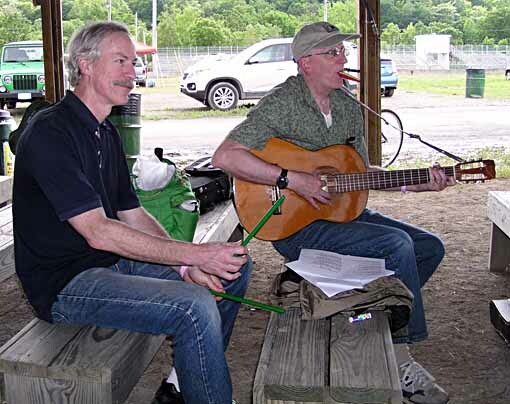 Tim and I have been playing music together off and on since we were kids, but there was so much to do here, we decided to each go to different events this time. 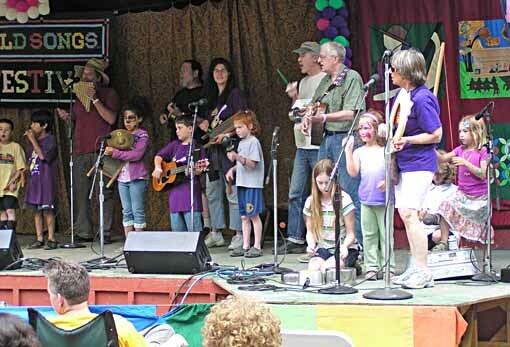 The one that appealed most to me was the Jug Band, one of two music group workshops geared toward “kids of all ages,” as it said in the program book. I had brought my guitar and a few likely instruments like kazoo, and planned to join in. 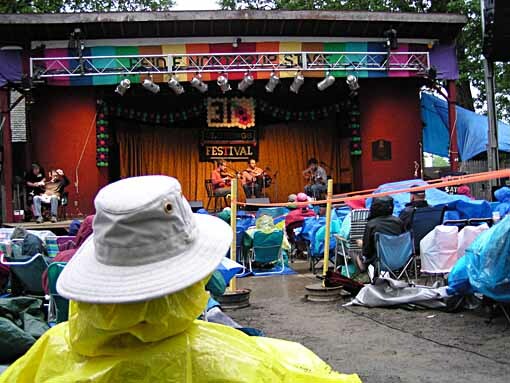 There would be three “rehearsals,” one each day, then on Sunday the Jug Band would perform on the main stage. 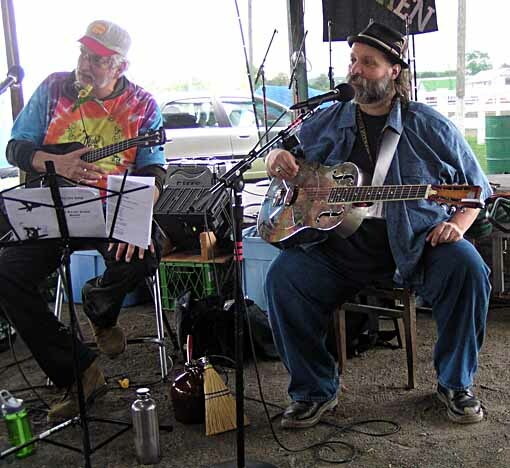 I’ve been a fan of Jug Band music since discovering the records of The Jim Kweskin Jug Band in the 60s, and I already knew a fair number of songs from those albums, so it was right up my alley. The leaders were these two gentlemen, Ron Gordon and Michael Eck, both of whom have been doing the Festival Jug Band for some years, and they were great. They passed out a booklet of Xeroxed lyrics covering about a dozen songs by the Kweskin group and others, and had bins full of “instruments” for the kids, mostly noisemakers of all kinds, as well as kazoos. A handful of other adults were there to join in, so I didn’t feel too out of place, and soon I was playing, singing and kazooing along. The kids were noisy, but it was still fun. We regrouped for dinner (all the food was good, and there were plenty of Veggie choices for Ellen), and then went to the Main Stage for the evening’s concert. 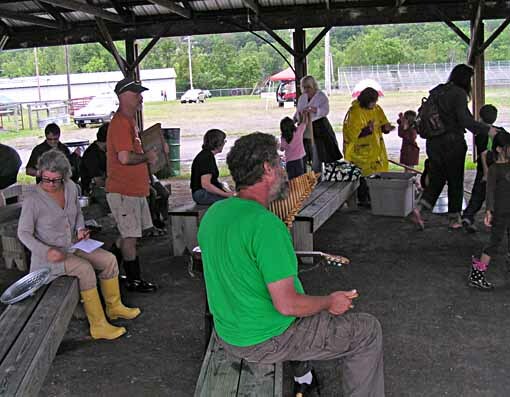 While most of the smaller venues had covered areas for seating, this one put the audience outside in a bring-your-own-chairs natural ampitheater, and the weather was not good. Most of the evening it rained. Not steady, not hard, but enough to make things less than ideal. The music, though, was terrific! Each act did about 20 minutes, and they were all good, though of course some appealed more to us than others. 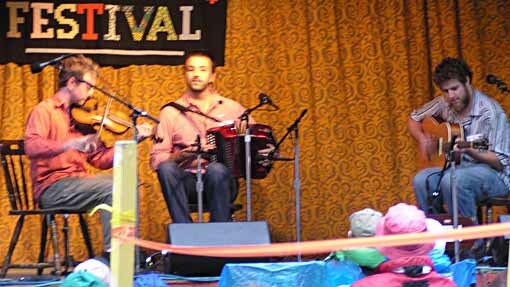 The first act was The Press Gang, a trio playing traditional Irish and related tunes on fiddle, accordion and guitar. I liked them enough that I bought their first (so far) CD, and am listening to it as I type this. We also enjoyed Acoustic Eidon (a duo playing guitar and cello), Ellis (young female singer/songwriter, very cheerful and funny), Bing Futch (reggae-influenced mountain dulcimer music), Jez Lowe (long-time English singer/songwriter) and the Arrogant Worms, a Canadian group doing humorous and satyrical songs. A fine evening of music, wrapping up at 11:30 PM. We were well ready to get back to our hotel by then, I can tell you! Despite raincoats and umbrellas, we were pretty wet and cold, and I have some small idea now of what Woodstock 1969 was like in the rain. Tim even more so, as he was camping there. Not surprisingly, today I started feeling a cold coming on. While there were still some rain showers on Saturday, there were also some sunny periods, making the atmosphere much cheerier. There were vendors to visit, and ten tracks of programming in the various buildings, each with four or five events. Ellen, Tim and I found we were all drawn to different things, but also did some things together. 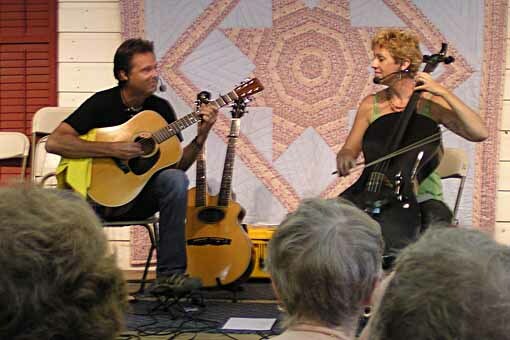 Ellen and I started at the Dutch Barn concert, where among other things there was a celebratory song about the just passed gay marriage law in the state, and that’s how we found out about that. I next took my guitar to a DADGAD workshop. DADGAD is an open guitar tuning using those notes instead of the usual EADGBE tuning. 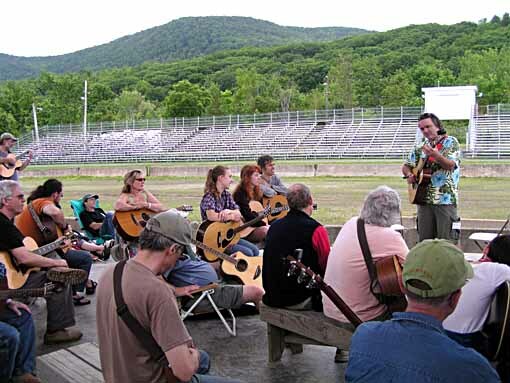 I’d tried a few open tunings many years ago, then given it up, but this workshop was great. The leader, Max Cohen, led the group through exercises teaching us five chords in the key of D, and by the end of the hour had us playing along with him and a hammer dulcimer player in a Celtic song. It was fun, and I hope to have time to work in DADGAD on my own in the future. After that I regrouped with Ellen and Tim for lunch. After lunch Ellen and I caught part of another performance by Acoustic Eidolon, Joe Scott and Hannah Alkire who were again very good. Joe has an unusual instrument he calls a “guitjo,” which is behind him in this picture. Here’s a better look at it. Joe designed it, and had it made for him. 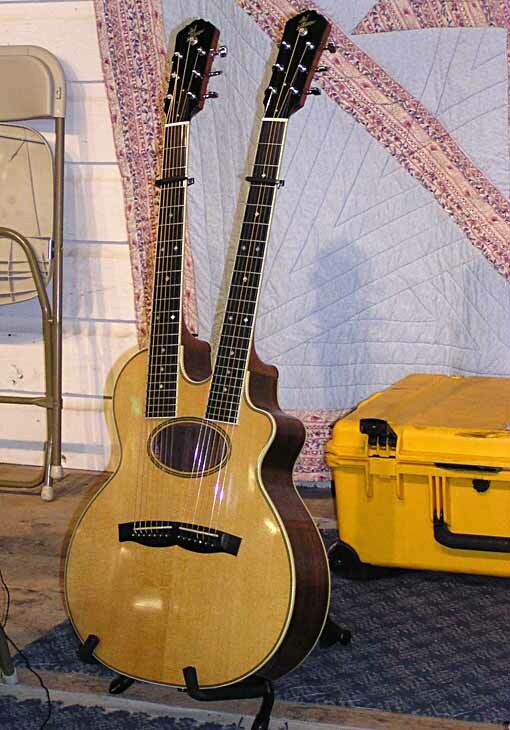 It has two necks, each with seven strings, and he manages to play both necks almost at the same time, giving a very rich sound that goes great with Hannah’s graphite cello. Ellen bought one of their CDs. Ellen and I stopped for a while to listen to the “Old-Time” trio The Freight Hoppers jamming with anyone who wanted to join in. Tim had heard them earlier and thought they were great. 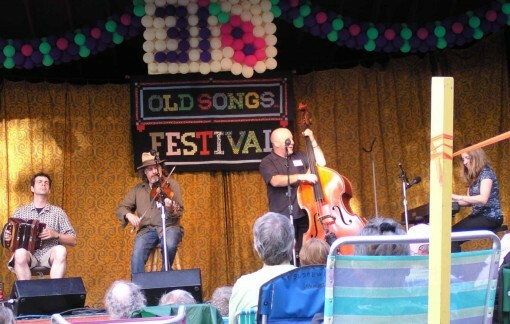 They were, though the style of fiddle tunes and southern mountain music they do is rather repetitious, and not my favorite, but they were great at it, and even better that night on the main stage. 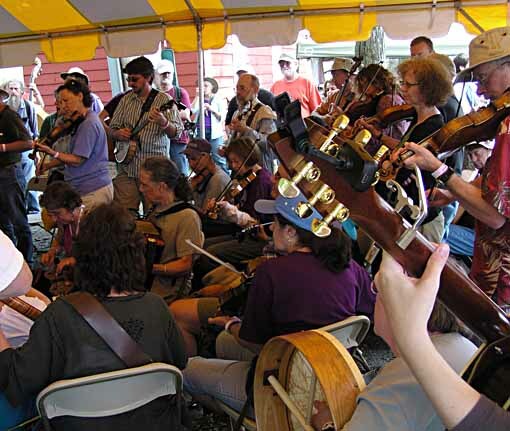 Here are some of the players gathered around them for the jam, and it’s quite a cool thing to hear dozens of fiddlers, banjo players and so on all doing the same tune. 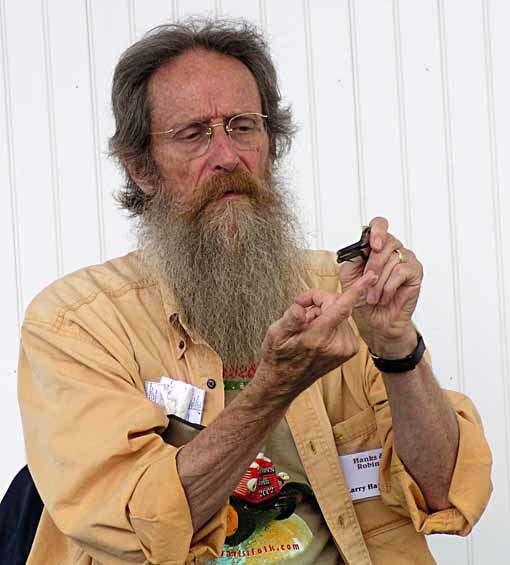 Next up for Tim and I was a workshop on the Jaw Harp, which was short on actual instruction, but interesting all the same for the historical background on this ancient instrument known throughout much of the world over the last 4000 years. This is Larry Hanks talking about how they work. He and another leader brought examples from all over the world, many quite different than any I’ve seen. While I picked up a few performance pointers, more could have been done there. 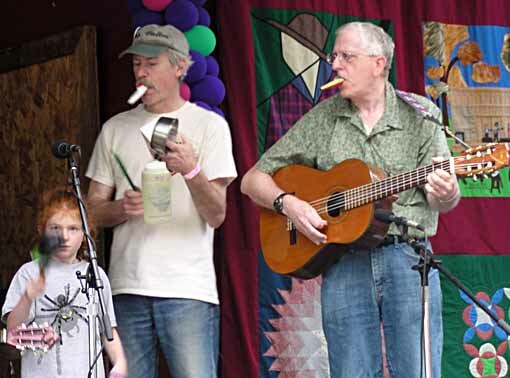 Then it was time for the Jug Band rehearsal, and Tim joined me this time, playing along with rhythm sticks and kazoo. The leaders were still playing through different songs, trying to get us to decide which four we should do at Sunday’s performance. The opener would be “Jug Band Music,” but the rest were open to suggestions. I had fun doing them all, and let others vote. After a dinner break we returned to the Main Stage for the evening’s music, and again there was lots of variety, and many fine performances. 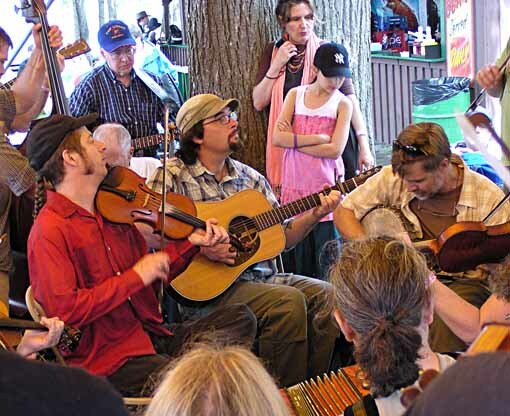 We particularly liked Quebec dance band Tidal Wave, seen above, as well as quartet Finest Kind, Friesian band Kapriol’, The Freight Hoppers, and a group of young Irish players, The Outside Track. We did get rained on a little at the end, but were much more comfortable this time! Sunday morning there was another Jug Band rehearsal, and time for a few more events, then at noon Tim and I reported behind the Main Stage for the Jug Band performance. We would go on after the other youth group, the Groove Band, which sounded great, doing traditional Irish music and then Woody Guthrie’s “This Land is Your Land.” I feared the Jug Band was about to lower the average, but our group of eight adults and about a dozen kids took the stage and did our best! Later, Ellen said it sounded good. Hope so, it was fun, even though I messed up the chords on much of the last song. Ellen said you couldn’t really hear my guitar anyway, which is probably just as well! The kids had fun, and really, that’s what it was all about. After the first number we did “Who Broke the Lock (on the Henhouse Door)?” where they got to make chicken sounds, and “Shake That Thing,” where the noisemakers had their solo bits to be as loud as possible, and finally “Voh Doh Dee Oh Doh,” which I knew in a different version as “Crazy Words, Crazy Tune” from Kweskin. The kids loved getting to yell “RED HOT MAMA!” in that one. Tim and I had fun, too. I always wanted to play in a jug band, and I finally got the chance. Here, I’m looking a bit worried because I’m concentrating on the chords the leaders were playing, trying to follow along. Hey, they had music stands, we didn’t! Tim is using his rhythm stick on several objects, and we both joined the kazoo parts. Perhaps the funniest thing for us was another of the adults who, at just the right moment, clanged together two large metal garbage can lids like very loud and effective cymbals. Only, she hadn’t done it in the rehearsals, so it scared us the first time, then was quite funny! After lunch and more music we headed home, a long drive, but we enjoyed our musical weekend, and would recommend it to anyone. 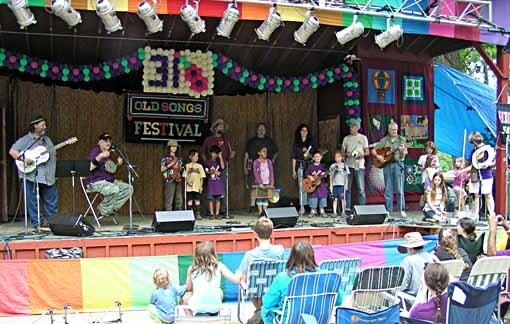 Maybe we’ll be back for the 32nd annual Old Songs Festival next year. This entry was posted in Family and Friends, Music, Reviews on June 27, 2011 by Todd. I should begin by saying that one of the members of the choral group Counterpoint is an old friend, so I may be biased, but this is the best new choral Christmas CD I’ve heard in years. 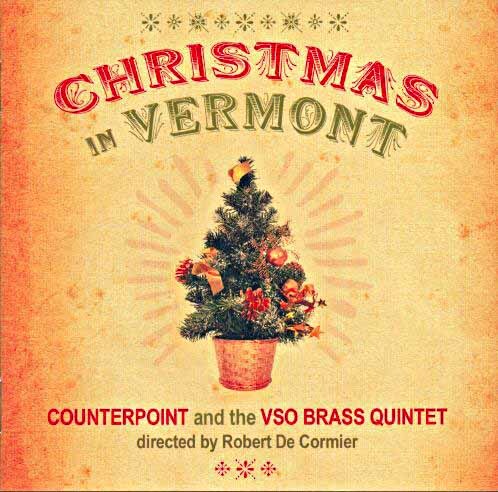 Counterpoint is a twelve-member choral group based in Vermont, directed by Robert De Cormier, who had a long and successful career with recording artists and groups like Harry Belafonte, Peter Paul and Mary, and the New York Choral Society. Since retiring to Vermont, he’s kept busy with the Vermont Symphony Orchestra chorus and this small group of top voices. This is their fourth CD, all of which reflect De Cormier’s eclectic taste, with wide-ranging influences from around the world. The longest and most important selection is Daniel Pinkham’s Christmas Cantata in three short movements. Pinkham, who died last year, was one of America’s most prolific composers in the last century, though he’s best known for works focused on holidays and weddings, and his Christmas Cantata is probably the most popular. I first heard it performed by my high school choir in the 60s, and have loved it ever since, it’s one of my favorite pieces of Christmas music. Showing the influence of his teacher Aaron Copland, it’s full of warmth, mystery, occasional dissonance, and great joy. I have about 5 recordings of it, and my favorite has long been that of the Robert Shaw Chorale, but this new one has now taken the top spot. By using just 12 voices, Counterpoint delivers a sharply-focused performance that makes every word and note clear, which is usually not the case with larger groups. Sort of like a madrigal group performing a big choir piece, it really brings out all the great harmonies and latin text. The rest of the CD is equally well-performed, and ranges from traditional Christmas carols to spirituals, and songs from Haiti and the West Indies, England and latin text tunes I’ve never heard before that sound quite old. There are also selections by the brass quintet alone that are very appealing. This entry was posted in Music, Reviews on December 14, 2007 by Todd.